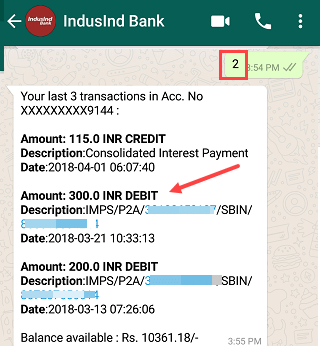 Good news for Indusind Bank customers, now you can check your account balance and mini statement on WhatsApp by sending an SMS. IndusInd Bank has become the first lender to start using WhatsApp social banking provide basic banking services to customers. With Whatsapp banking , customers can check their account balance, get a mini statement, check reward points as well as update Aadhaar. If you are Indusind Bank customer then register today and get your balance and mini statement on whatsapp instantly. 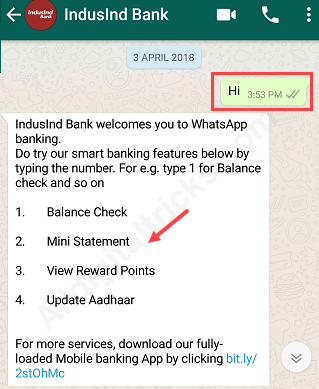 Here is step by step guide how to register Indusind bank whatsapp banking and check account balance and statement. To use this service make sure you are using your bank registered mobile number on Whatsapp. If you are registered on whatsapp with different number then it won’t work. There is no registration process to use this service, just save the number provided by bank and start using this facility. 2: Now open your whatsapp and refresh your contacts, you can see Indusind bank profile. 3: Now type “Hi” and send. Soon you will receive reply message. You will see different services like balance check, mini statement, update aadhaar. You just need to send number like 1,2,3… which mention for services. 4: To check balance type 1 and send. You will get your available balance reply message instantly. To check get mini statement type 2 and send. You will receive mini statement reply message. This service available for all customers absolutely free of cost. 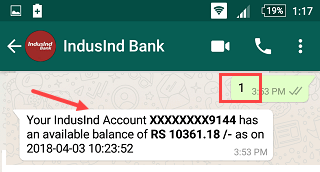 So without visiting ATM, bank now use Indusind bank whatsApp banking facility to check your account balance and mini statement. No registration, just save the number and say Hi.